Golandoon Irani - meherbabatravels jimdo page! 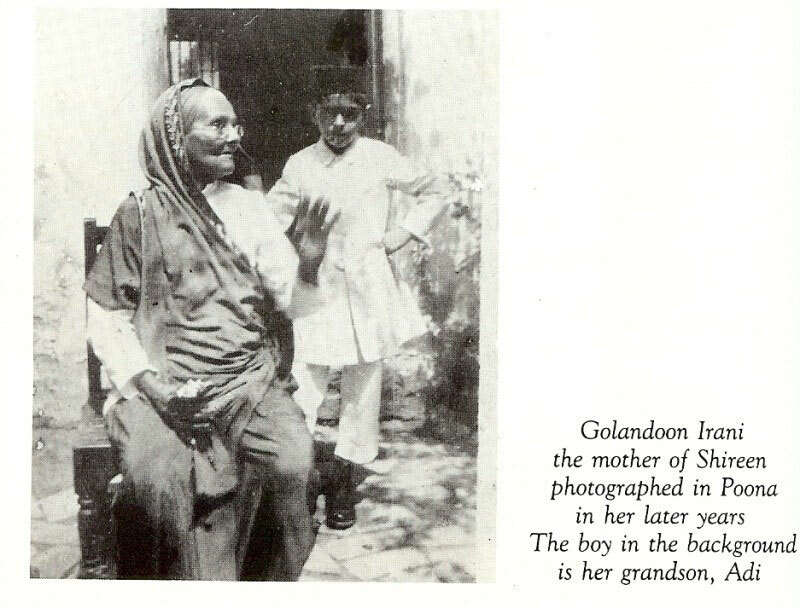 In Irani families, meat is the mainstay of their diets, so preparing separate vegetarian food for Sheriar was a problem for Shireen's mother Golandoon, who did the cooking. Shireen was pregnant and, in her condition, needed rest. Golandoon confided to Shireen that if she cut little pieces of meat and mixed them in with her husband's food he would not know. Shireen agreed to this plan. One day she prepared dal with tiny pieces of (goat) mutton in it and served it to Sheriar, who could taste that it contained meat. His ascetic vow was broken and, when he was told that the dal contained meat, he told Shireen with a heavy heart, "Child, may God forgive you, for you do not know what you have done." That night, Shireen dreamed that two gigantic African men were standing over her with whips in their hands. One grabbed her and held her down while the other tried to force her to drink from a cup. Shireen looked into the cup and saw that it was filled with blood. She shook her head screaming, "No! No! I won't drink it. I won't!" One man angrily raised his whip to strike her. Terrified, she began weeping for mercy. At that moment she awakened. The next morning when Shireen narrated this nightmare to her mother, Golandoon understood its meaning and, repenting for having persuaded Shireen to deceive her husband, said, "God forgive us." But from that day onward, Sheriar gave up vegetarianism and ate whatever type of food Shireen served. During her pregnancy, Shireen would often have wonderful dreams and describe them to her mother Golandoon, who would interpret their meaning. From the day that she conceived, the young woman was convinced that her expected child would be extraordinary and remarkable. Sheriar shared his wife's expectation. He would read beautiful ghazals (Persian poems to God) to her from the Divan of Hafiz, explaining the poetry's hidden meaning. Sheriar was a poet and he would occasionally compose monajats (Zoroastrian prayers) and other spiritual songs on divine themes and recite these to Shireen. During this period Merwan would often slip out of the house to visit Babajan. At one point Memo became so desperate and worried about Merwan's condition that she persuaded her mother Golandoon to accompany her to confront Babajan. The two ladies approached Babajan, and Memo pointedly asked, "I know Merwan visits you frequently. What have you done to my son? What have you to do with him? Why does he visit you? He has never acted like this before." Babajan smiled at the two ladies and muttered, "Merwan ... Mera piarra beta." Babajan's remarks intensely irritated Memo, who turned to Golandoon and said, "The nerve of her to call Merog her son. How dare she!" Babajan kept muttering, "Merwan ... He will shake the whole world ... He will awaken the world." When asked by Memo what she meant, Babajan refused to explain. Soon Babajan shifted the focus of the conversation and had Grandmother Golandoon reminiscing about the old days in Persia. Much to Memo's chagrin, Golandoon (who had a sweet voice) and Babajan ended up singing together in Persian, weeping and swapping stories.